We found this icon somewhere on the web, liked it and wanted to share it with you in case you had not seen it yet. It borrows from the food nutrient pyramid we all learned in 5th grade and amends it to personal energy use. 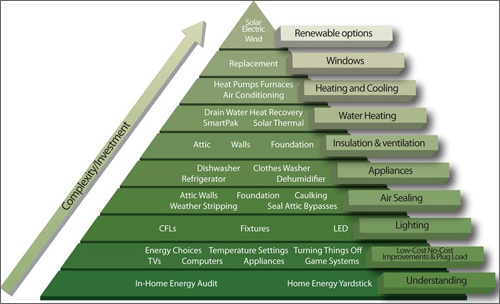 Everyone from the most energy conscious renter of a 1 room flat to those whose home structure is synonymous with their lot lines, can learn from this chart. We will do some research and offer you the costs for each level for a 3 BR 2 Bath home in future posts BUT we will say that most utilities around the US will give you a free audit of your energy use. Likewise many AC and Heat contractors will give you a free estimate on how much a more efficient heating and air system will cost you.